Senior Joel Estabrook fires a pitch during a one-hitter against Churchill County on Thursday, May 10. Junior Spencer Edmondson makes a play in the field against Churchill County. Senior Colin Just looks to turn on an incoming pitch during the regional playoffs on Thursday, May 10. Sophomore Tyler Estabrook puts on the brakes as he rounds third base against the Greenwave. Junior Shane Poe looks to put a ball in play against Churchill County. Third baseman Spencer Edmondson makes a paly on a ball against the Greenwave. 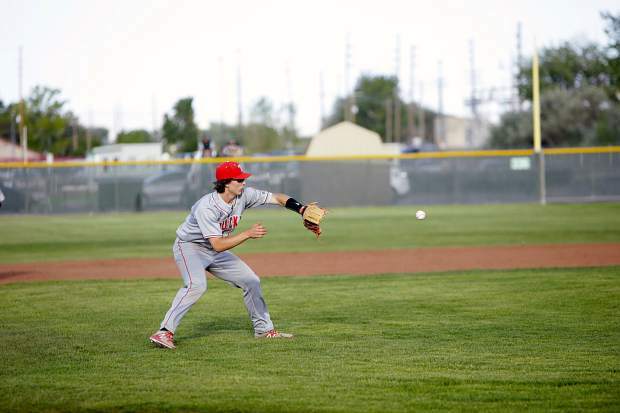 The Truckee baseball team will play in its first state tournament game since 2013 when the Wolverines take the field at McQueen High School in Reno to face Southern League champion Boulder City. 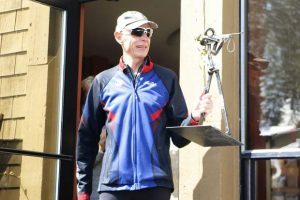 Truckee goes into the four-team, double-elimination tournament as the Northern League runners-up after a memorable run through last week’s regional tournament. 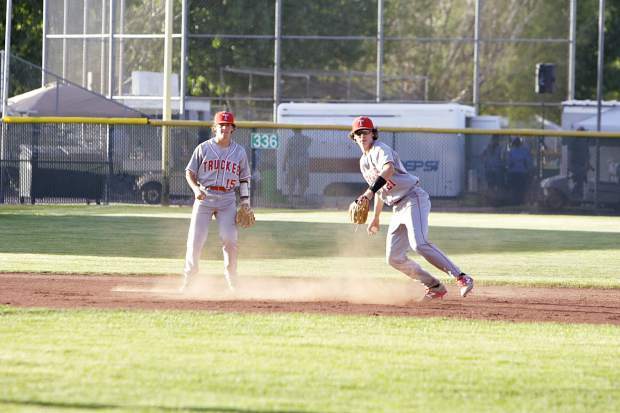 Truckee opened the postseason on Thursday, with a 6-3 win over Spring Creek. 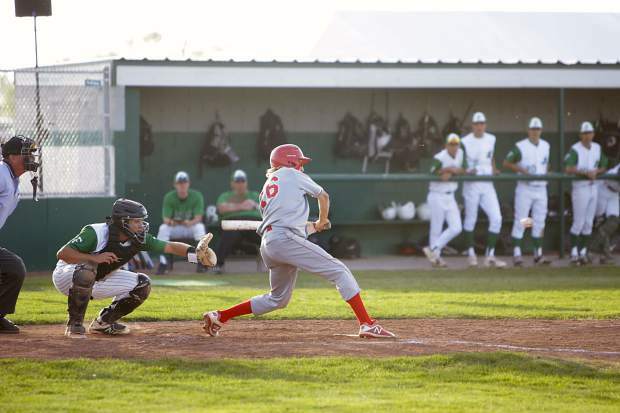 Junior Derek LaFerriere led the team with a pair of doubles and two RBIs as Truckee advanced to a matchup later that day against tournament host, and No. 2 seed Churchill County. 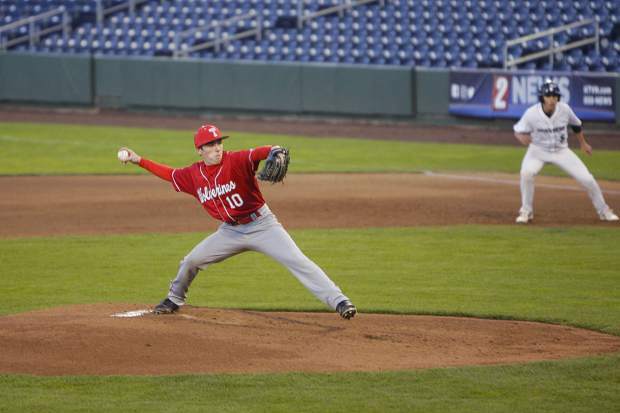 Wolverines senior Joel Estabrook took the hill, and turned in one the best performances of the season with a one-hit gem to propel Truckee to a 3-2 victory. Estabrook walked three batters and allowed a single to begin the game, but from that point on, shut down the Greenwave lineup. The senior pitcher finished the game with two strikeouts, five walks, and two earned runs. He also made the final out, snagging a popup to complete the one-game effort. 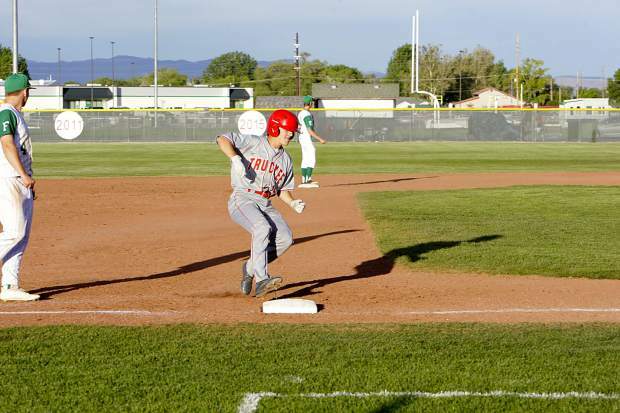 Truckee then faced Elko the following day for a chance to qualify to the state tournament, but seven errors in the game and an offense that was limited to four hits led to a 6-2 loss, dropping the Wolverines into the loser’s bracket. 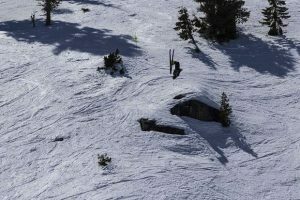 Truckee faced rival South Tahoe on Saturday in the loser’s bracket final with the winner advancing to the championship game against Elko and earning a berth into the state tournament. After falling behind 1-0 to open the game, Truckee bounced back with a two-out double from senior Colin Just to score a pair of runs. Junior Marcus Bellon, who recently returned off injury, then smacked a triple a batter later to score two more runs. The Vikings tied the game an inning later off a walks and a two-run single to center field. South Tahoe then took a 6-4 lead in the third inning. Joel Estabrook brought the Wolverines to within one in the bottom of the fourth with a double to center field. Truckee’s next two batters drew walks, pushing the tying run across the plate. The Wolverines went on to take the lead for good the next inning off a sacrifice fly from senior Tyler Ferrera. 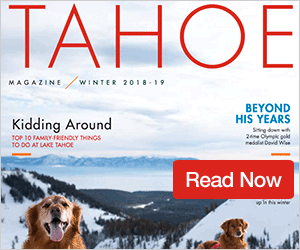 The Vikings threatened with runners on second and third and no outs in the top of the seventh, but senior Gary Grosjean slammed the door on South Tahoe’s season with a pair of strikeouts followed by a popup. 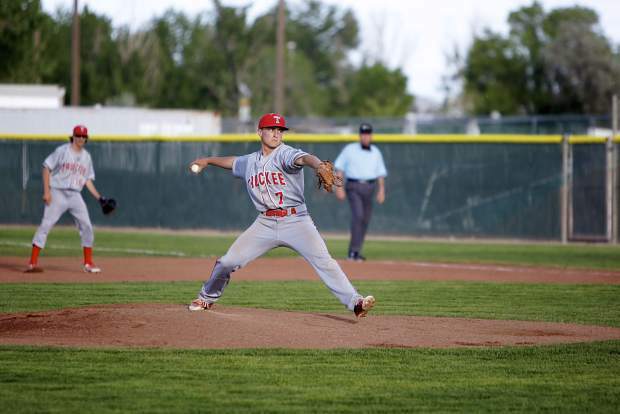 Grosjean went four innings and struck out five batters while allowing three hits and no earned runs as Truckee earned a rematch with Elko. Unfortunately, the Wolverines run in the regional tournament came to an end later that day after a 5-4 loss to the Indians via a walk-off line drive to right field. 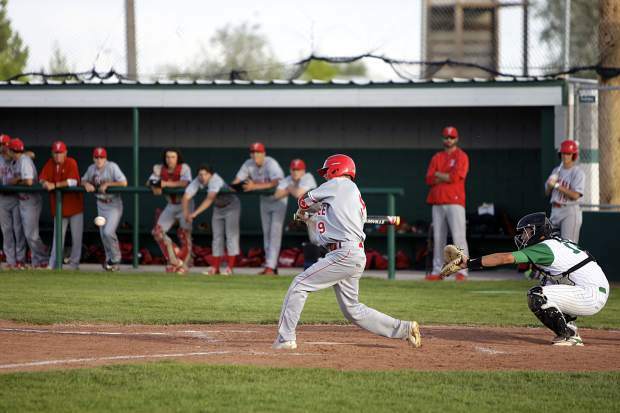 After trailing 3-1 through five innings, Truckee took a 4-3 in the top of the sixth off a two-run double by sophomore Tyler Estabrook, followed by an infield single by Bellon, which plated another run. But Elko managed to erase the deficit the following inning on a single to right field to win the Northern League championship. Since Elko went undefeated through the double-elimination tournament, Truckee would have needed to beat the Indians twice to claim the title. Truckee will open the state tournament against Southern League champion Boulder City at 1 p.m. Thursday, May 17, at McQueen High School in Reno.